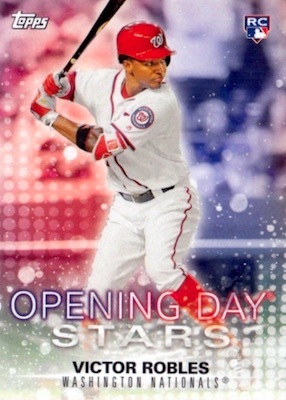 Still emphasizing fun over the big-hit frenzy that has enveloped the card world, 2018 Topps Opening Day Baseball makes the themed insert sets a primary focus at one per pack. However, as the 2017 set showed, there are still some rare OD options and even hits to chase, and 2018 is the same. Using the '18 flagship design, but with an added brand logo, the 2018 Opening Day base set features 200 current players with key rookies. This includes 75 subjects from the main Series 2 lineup. 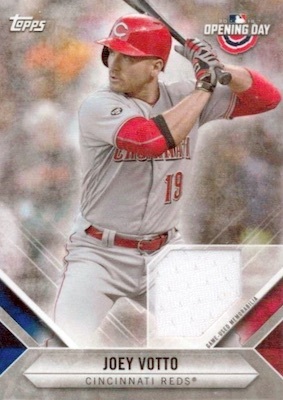 As far as the rare versions, parallels consist of Opening Day Edition (limited to 2,018 copies), Opening Day 1/1 Edition and Printing Plates (1/1). 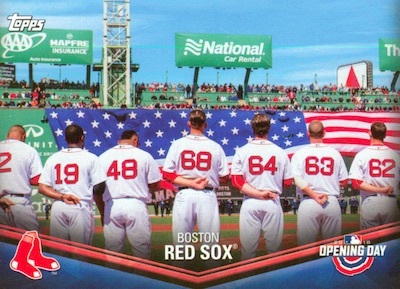 In addition, the 2018 Topps Opening Day Baseball checklist includes short print image Variations. 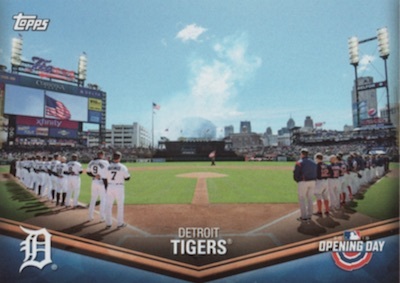 Moving to where much of the excitement is found, the 2018 Opening Day inserts touch on many themes, falling one per pack. Opening Day looks back with shots from the start of the 2017 season, while Before Opening Day is new and takes collectors on a trip to Spring Training. Also debuting this year, Dugout Peeks provides a snapshot of the just-off-field action, and Team Traditions and Celebrations highlights the unique rituals of each fanbase. 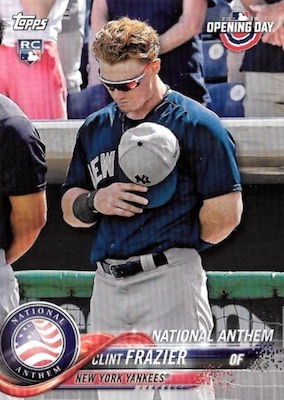 Other choices include National Anthem, in honor of the pre-game festivities, and Stadium Signatures, which covers the player-fan dynamic in regards to getting autographs at the ballpark. 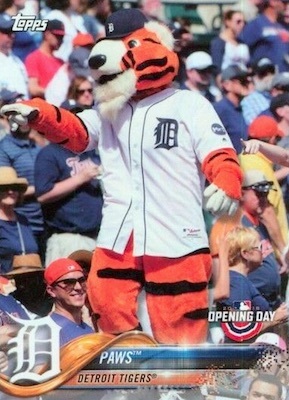 In addition, the Opening Day Stars set is back with 40 cards, and so are the lovable Mascots cards. 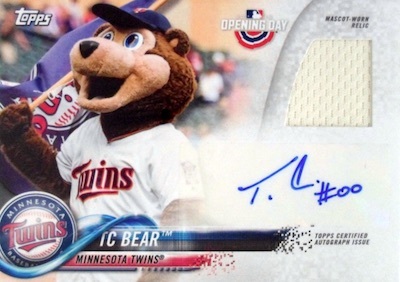 Although quite tough to uncover, 2018 Topps Opening Day Baseball still offers a few elusive hits to chase. 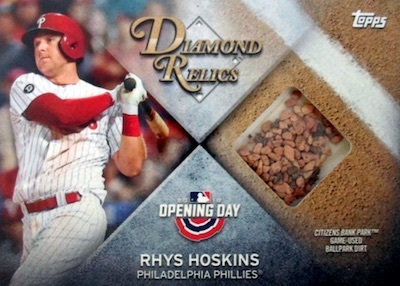 Beyond the standard Opening Day Autographs and game-used Relics is the Diamond Relics insert that provides actual field dirt in the card. PARALLEL CARDS: Blue Foil (1:9 packs), Opening Day 1/1 Edition, Printing Plates 1/1. 1:477 packs. Full Guide and Gallery. 14 cards. 1:701 packs. Shop on eBay. 5 cards. 1:1,560 packs. Shop on eBay. 20 cards. 1:1,791 packs. Shop on eBay. 25 cards. 1:286 packs. Shop on eBay. 25 cards. 1:572 packs. Shop on eBay. 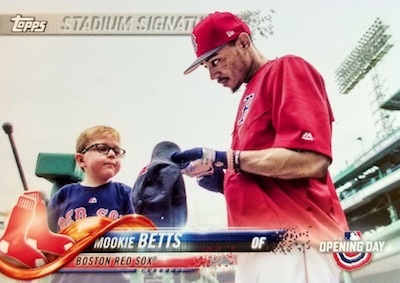 View the 2018 Topps Opening Day Baseball checklist spreadsheet. 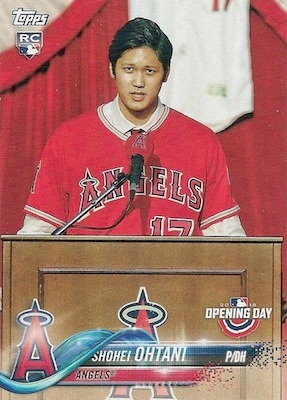 Good: First base Ohtani rookie card; very low box price; themed inserts are fun. Bad: Comes across as flagship lite; many of the inserts have crazy odds; no real identity. 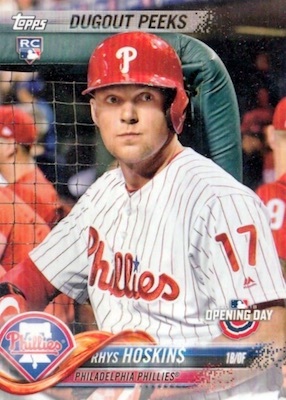 The Bottom Line: 2018 Topps Opening Day is amusing, but the odds are very stacked against you. Other than mascots and some very rare inserts, there is little to draw in collectors unless they are looking for an easy base set to build. For a supposed kid set, it could really use a fresh influx of creativity. 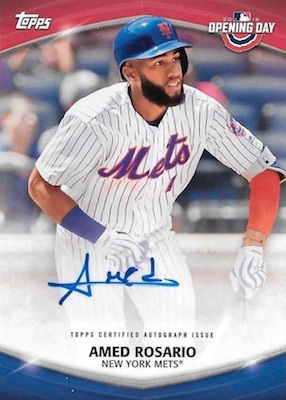 When it comes to the base design, the only thing that is different from flagship is the printed Topps logo (instead of foil) and the OD logo in the corner. Even most of the images are the same and backs are virtually identical. No matter the price, that is a negative for me. If you are talking about the designs unique to the set, there are multiple inserts, so that is at least nice. 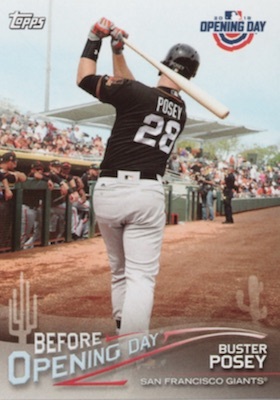 However, many of these also feature the flagship look, including some of the SSP inserts like Dugout Peeks and Stadium Signatures, which have the appearance of base variations rather than standalone inserts. My favorite is Before Opening Day, mostly for the Spring Training shots, but also because of the palm tree and cactus silhouettes in the design. In addition, I found the Opening Day Stars to be odd. They feel like sticker cards, which is what they are supposed to be, but I could not actually remove the backing to stick it. Maybe I just got a bad sticker. Despite the fact that the game-used dirt idea is not new, and the cards average like 1:50 boxes, I really liked how the Diamond Relics turned out. 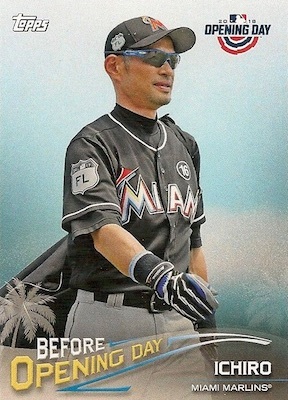 It's a stretch to connect that dirt to one specific player, but I enjoyed the diamond-shaped background that split the card into a player photo and an image of the infield. Getting Shohei Ohtani into the base set when he wasn't in Series 1 is huge. The fact that it's his first base rookie makes it more appealing even if the value is never going to push too high. Of course, the autographs and relics are very limited but that is to be expected here. When you look at the overall checklist, it does seem pretty diverse. But then you see that four inserts and the base variations carry odds of at least 1:286 packs (and some are much, much tougher), and all the hits are also very rare. I admit that I do not understand the 25-card Mascot set that features four different cards for the Reds. 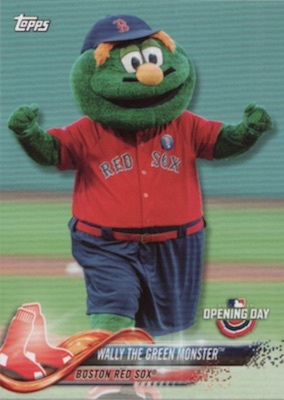 This is clearly an instance where every team with a mascot should have received at least one card. At around $30 per box, the value is interesting. In most boxes, the best you can hope for is a rookie or two for Ohtani and a blue foil base parallel of a top player. Still, the longshot chance is there for a rare hit, which can turn a profit on the box price. While OD is not the set to go chasing value, the glimmer of hope is present for something very rare, which is uncommon at this price. My fun suffers when it feels like I am looking at the same thing despite it being a new product. Opening Day needs its own design. The themed inserts do provide a little dose of fun, but it still needs some fresh ideas. You can only play up the mascot angle for so long. 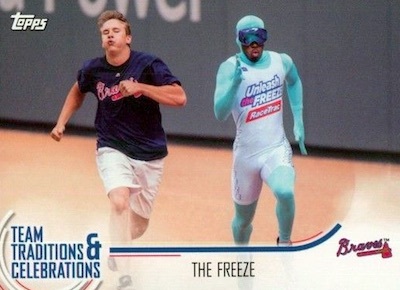 Perhaps that creativity is being funneled into the new Topps Big League Baseball product. Love me some Opening Day! Opened a case with my son last year and will do another one or two in 2018. Last year it was advertised that the blue parallels would be numbered /2017. They were not. I’m going to assume that they won’t be numbered again despite what this article says. I wish they were though. I love the price of 99 cents a pack. I am always able to add something to my collection from these packs. I recently bought one of those $20 Fairfield Company mixed boxes from Target. One of the packs was a 2016 Topps Opening Day. I pulled a “Wally the Green Monster” mascot autograph. …a fun product to open! The SSP and SP seem to hold their value really well. The dirt cards look intriguing. Super fun, affordable set for real collectors, not gamblers. so Topps is on the market.. up for sale.. because they are losing money on making Baseball cards. How much do they pay for that major league dirt… thats gotta be the killer in the budget right there. I want cards with real game used pinetar or rosin and used sunflower seed shells from the ballpark. I didnt say used gum because then you might think I was being silly. 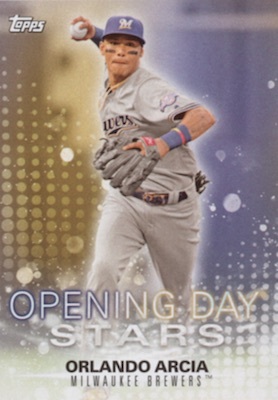 Usually I skip Opening Day because its the same design as the main Topps release which is also very budget friendly but with the first official Ohtani rookie card in this set I am going to have to check it out. 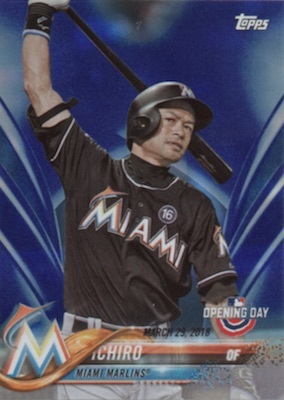 Do you think the shohei othani base card or opening day card #/2018 will be worth much? How much do you think they will go for? No Oriole Bird mascot again?!?! This is the 3rd year in a row without him! 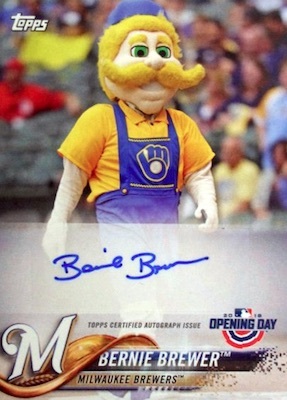 Like Brian stated, there are 4 Reds mascot, let’s mix it up a little better Topps! I went to Target tonight and saw these for sale. A blaster of 11 packs was priced at $19.99. Individual packs were only $.99. I don’t understand this pricing. I checked and it appeared that the odds listed on the side were the same so I can’t understand the reasoning for the price increase since there didn’t appear to be a guaranteed relic or autograph in the blaster box. Am I missing something here? No love for Lou Seal or Stomper. In fact both teams get no autographs, relics, or mascot cards. 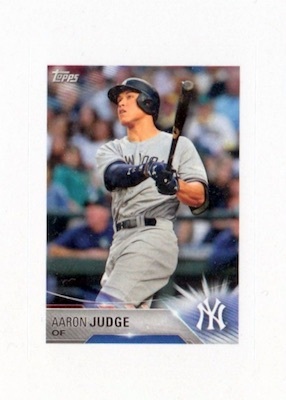 I won’t be buying this till that changes Topps. If you scan the blaster it will ring up $9.99. The $19.99 price is an error. For one time TOPPS always hits the nail on the head with these boxes!!! Opened a new 2018 box today & got a complete with the plenty of inserts & only 9 duplicate cards… For a set collector, the collation of cards is a wonderful addition to TOPPS who normally isn’t that great with making a set/box… Kudos to TOPPS!!! Even though I didn’t pull an Orbit, this is always a fun break at a great price! 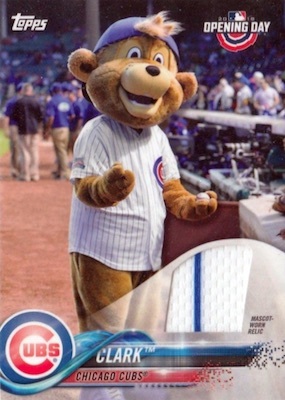 “…lovable Mascots cards.” C’mon. The author cannot actually believe these are ‘lovable’. Just garbage. As alluded to in previous comments, there is so much crap being passed off as inserts. Garbage. Let’s say there was an error at the Topps plant and you bought a 99 cent pack. You opened it and you got all 25 mascot cards. How pissed off would you be? I agree with Brian and Chris Donati – no love for Stomper or Lou so I won’t be buying the product. I was going to do a set initially because I like this year’s flagship design and didn’t want to spend the money putting a regular set together. Oh well, I’ll just find the cards of the teams/players I like and call it a day. If your looking for a major hit your most likely going walk away disappointed. But if your looking for a fun super cheap set to build or simply want to load up on affordable Ohtani rookie cards this is the one to buy. Blaster boxes go for $9.99 and your going to find most of the big names rookies like Ohtani, Hoskins, Devers in just about every box. Opening Day is made for the younger collectors or for those on a budget. The odd thing is that the cheaper price OD cards are thicker and less bendable than the Flagship set. I just completed a set and these cards just look so colorful in hand. The backs also make this a cool set. The different colors. Topps has really refined its cards and made them look the classics. The blurry backgrounds give the cards a 3-d look which just enhances the color of the set. This works.